By now, if you have been reading my blog, you will know how important collaborations are to me. As I have said before they really are a cornerstone of my business, and whilst I am not going to labour that point here – I want to introduce someone to you whom I have been working with on and off over the last few years, jewellery designer, Tarra Rosenbaum. I met Tarra through a photographer friend of mine, Roger Eaton. Roger asked me to have a chat with a friend of his who was in London from New York and help guide her, as she was a designer, new to the UK, and talk through ways to position her brand. So we met, and Tarra showed me her jewellery. I was immediately taken with how beautiful her pieces were. I invited her to be part of an evening where I was presenting a new collection to my customers, so she could introduce her work to them too. Tarra’s jewellery complimented my work so well that I suggested that she could showcase some of her pieces in my shop on an on going basis. Initially, I was drawn to Tarra’s Autumn Gold Leaf collection – these pieces in particular worked really well with what I was doing at the time. There is a simplicity in Tarra’s designs that is coupled with an earthiness that I really like. I also respect the thought that she puts into her creative process. We always design autonomously but occasionally Tarra has adapted a collection to parallel what I am doing with my work. An example of this is her Isis collection where she added red and yellow enamel to pull out key colours in my most recent collection, Urban Legends. Tarra Rosenbaum founded her brand in 2006 when she decided to take a 5-month sabbatical, leaving her corporate career and jumping back into her creativity to make jewellery for a living. This has been a passion for Tarra since she was a child and has only grown over time. Her brand ethos is to create limited edition and bespoke pieces using ethically sourced gemstones and eco-friendly sourced precious materials, creating each piece with a strong element of spirituality. She draws a lot of her inspiration from nature, which is visible through her unique and bold yet delicate designs. Tarra Rosenbaum is very hands-on with the creation of each individual piece, from the conception stage through the design process and finally to production. She has a very creative mind but she also knows what she wants and how she wants it to be done. All of her designs are her personal, original creations and they are each delicately hand-crafted and cared for. Her beautiful pieces are both classic and timeless and her Aurora Ring is no exception. According to Tarra, she has her grandmother to thank for the conception of the Aurora Ring. Upon her death, Tarra inherited a valuable ring of hers that contained an old mine-cut diamond. 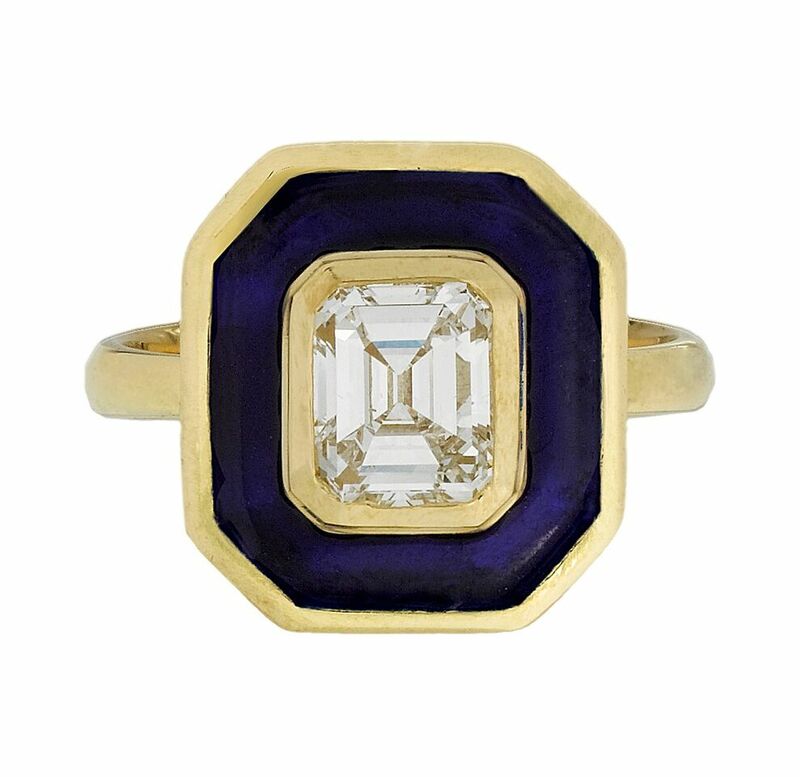 Tarra immediately recognized the stone’s beauty and value, but found that it was trapped in what she described as an old-fashioned, heavy 1970’s gold setting. When Tarra introduced the Aurora Ring to her collection, it was created as an engagement ring design, although with its growth she noticed more and more of her clientele designing the ring to be passed on to their daughters, granddaughters, and daughters-in-law; which is no surprise based on the Aurora Ring’s history. The Aurora Ring is a bold and elegant piece, a celebration of individuality, color, and the ancient technique of enamelling. The Aurora Ring takes many forms - it is a symbol of union between two people coming together, a family tradition to be passed down for many generations to come, and sometimes it’s a symbol of self-love and individual empowerment. It’s incredibly versatile as it is personal to each individual. It is wonderful working with Tarra as we have similar values and design styles. One of the things that I feel connects Tarra and me is her use of bold colours – like me, she is not afraid of mixing strong colours which results in a playful twist on her classical design. We work so well together and are both immensely supportive of each other. So, I am excited to announce that we will be having a collaborative event coming up in March, celebrating Tarra’s Aurora Rings and introducing my Spring/Summer 2019 Collection. Stay tuned for details.